One of the most interesting lines of furniture available today has it’s roots established back in the 1930’s before mass production and assembly lines and before furniture was being made in such a scale as it is today. Stressless as it is referred to was born out of several popular lines of furniture introduced by Jens Ekornes a successful manufacturer of the Svane mattress and Ekornes leather furniture lines made in Norway. 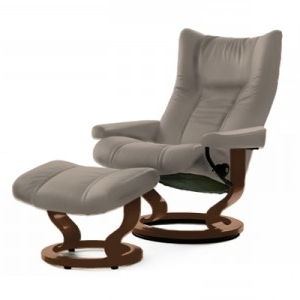 Stressless itself created it’s own history in 1971 and is sold throughout the world today. In this article we’re going to examine the history and relationship with it’s parent company Ekornes and the things that make Stressless different and unique from other types of furniture. Ekornes was founded back in 1934 by Jens Ekornes a Norwegian man who started the company with nothing more than a few German pieces of machinery and about 3 employees in Sunnmøre, Norway. What started out as a business that made steel spring components for furniture manufacturers evolved through modern technology and a desire to make a better product into creating their own mattresses and furniture. Several product lines have been introduced over the years. The first product line consisted of mattresses referred to as Svane. Svane mattresses were created out of the desire to build a better mattress and Jens Ekornes and his company invested much time and travel into finding the right machinery and techniques to building high quality spring mattresses after having built steel spring components for furniture manufacturers they had the necessary skills and knowledge to take that to the next step and did in the success that soon followed in the design of the Svane mattress. Another product line that followed after the success of Svane was referred to as Ekornes. This line was born from the infrastructure already in place that was producing wood furniture components and plastics/foams for other furniture manufacturers. The Ekornes line of stationary club furniture as it was introduced back in the 60’s filled a need for smaller, scaled down furniture that fit well into most European homes. This leather furniture’s initial introduction was a national flyer campaign used to introduce this product line to every home in Norway. The Svane & Ekornes lines did well and in 1971 a new line was introduced called Stressless. Stressless recliners were patented by Ekorne who introduced many new features never before used in the design of a recliner and it was this product that eventually put Ekornes & Stressless on the map globally for the accomplishments in this revolutionary new design for a recliner now sold in over 30 countries worldwide. In the early 70’s Stressless recliners introduced a unique glide system that allowed the chair to move with you. The patented system featured two rollers on each side of the recliner that moved along steel poles built into the underside of the recliner adjusting to you as you move in the chair. Ekornes continued to improve upon Stressless recliners by introducing a new feature called the Plus System. It was engineered into two places the head and lumbar regions of the chair. As you reclined back the head of the chair would move forward to keep you in eye level with whatever you were doing be it watching TV or reading a book. In the lower portion of the chair in the backrest a special lumbar support was designed into the chair that would extend out to support your lower back when in an upright position and would relax back into the chair as you reclined back. These two features of the Plus System worked together and formed the correct support for both your head and lumbar area in all positions. Today’s Stressless recliners feature these same options as well as 360 degree swivel bases on the chairs and ottoman now have adjustable comfort by allowing the individual to set it stationary or allow it to move with you with its built in glide function. Stressless® products carry a 10 year warranty on all working mechanisms. From 2001 and beyond Ekornes began developing matching leather furniture in the way of Stressless sofas, loveseats and chairs to coordinate with their popular Stressless recliners and ottomans. The look of these pieces took the same design elements used in Stressless recliners and introduced them into the matching furniture keeping the look and design consistent and as comfortable as the Stressless chairs & ottomans they were based on. Today every recliner in the line has matching pieces that can be used with them as well as low back and high back matching furniture which provides different looks and designs depending on you’re the needs of your room or living space. Ekornes continues to move forward with new innovations in the Stressless line of furniture and it will be interesting to see what new products and features will be available in 2008 and years ahead. In this article we’ve taken a brief look at the history of the Ekornes company founded by Jens Ekornes back in 1934 and the different lines of furniture they have introduced which include the Svane, Ekornes and Stressless lines of furniture. We examined the introduction of their most successful line of furniture Stressless recliners and the unique designs and features that made this chair successful on a global scale. Finally we looked at Stressless today and the additions of matching furniture and what these have helped provide in terms of coordinating pieces for the popular line of Stressless® furniture. If you haven’t had the opportunity to sit and relax in a Stressless product I would encourage you to find a local retailer or dealer and take the comfort test™ to feel the true comfort of a Stressless product.